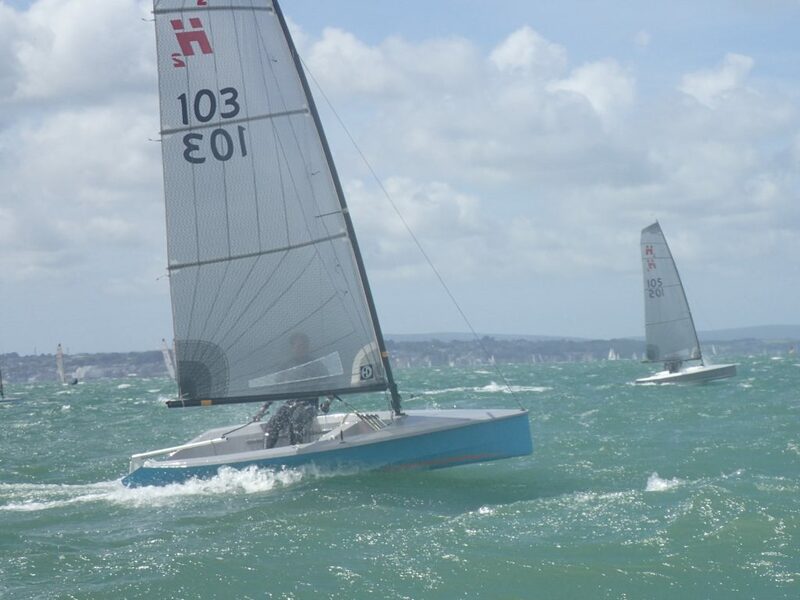 Hadron Dinghies have two demo boats available for competent helms to sail in any of the GJW Direct SailJuice races this winter*. 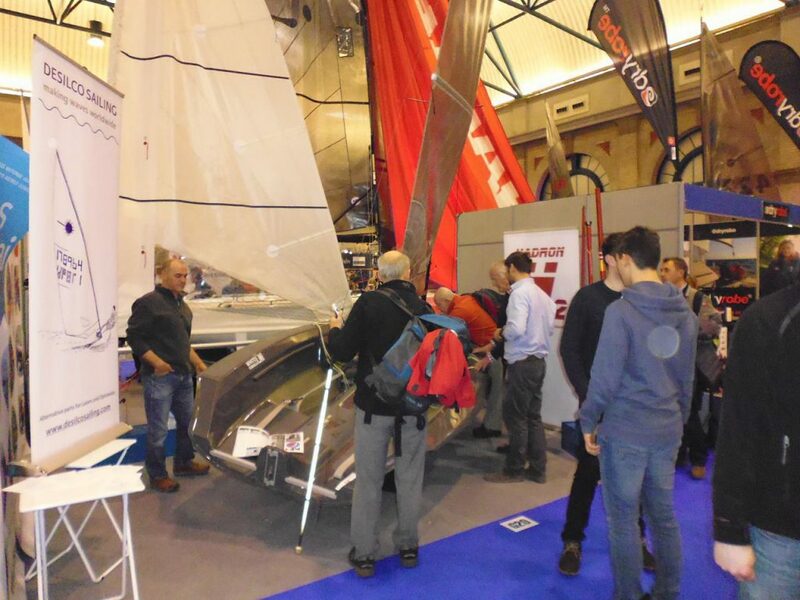 We will bring the boats to your chosen venue and have them rigged ready for you. If you wish to apply, please complete the APPLICATION FORM. 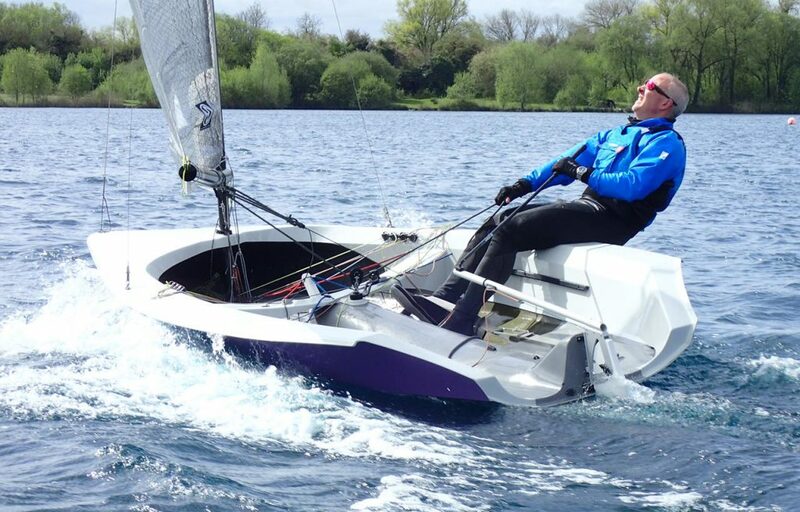 Mike Iszatt sails H2 #102 in the Grafham Grand Prix, 2 January 2017. * Subject to availability. Draycott Dash places already filled. This is a new event put on by CVLSC. Racing takes place on Saturday 21st October, but as the NOR states, all are welcome to stay for the Sunday which is our Club’s Visitors Day. This is a free-to-enter day – the morning is raced on handicap (the Hadron will be in the ‘fast’ race) and in the afternoon a pursuit race. There are already two H2s at CVLSC, including the national championship winning boat, so you will be assured of a warm welcome. 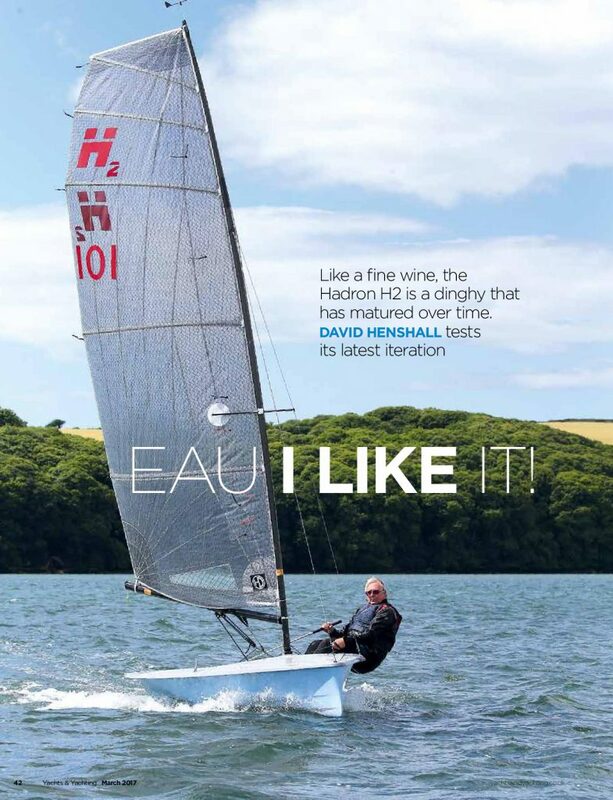 The March 2017 edition of YACHTS & YACHTING magazine (published on 10 February) features a boat test of the Hadron H2 by David Henshall. David borrowed an H2 for several weeks last year so has been able to give the boat a thorough and insightful assessment. You can purchase a digital copy of the magazine HERE. Mike sails H2 #102 in the Grafham Grand Prix, 2 January 2017. 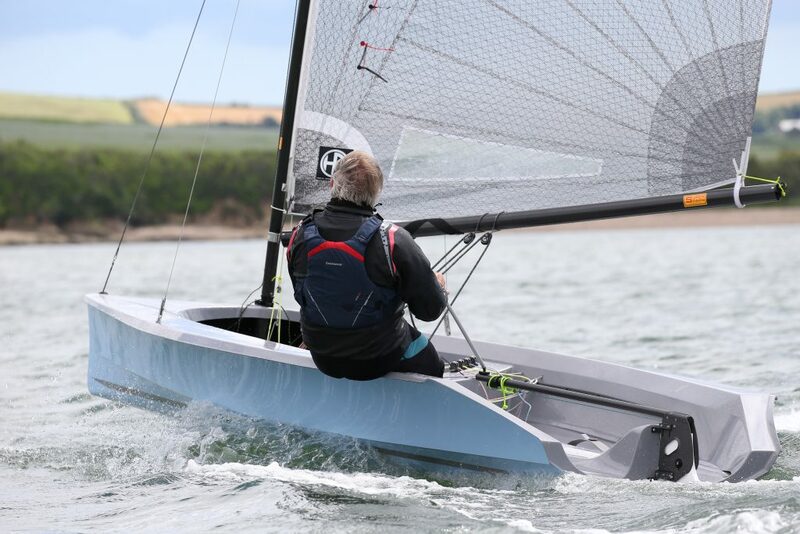 Top helm MIKE ISZATT, who sailed H2 #102 at the Grafham Grand Prix on 2 January, has provided us with this insightful critique of the boat. (Mike’s achievements include: Winner Bloody Mary, Grafham Grand Prix Slow Fleet, 3 time winner Leigh-on-Sea Brass Monkey, current club champion). 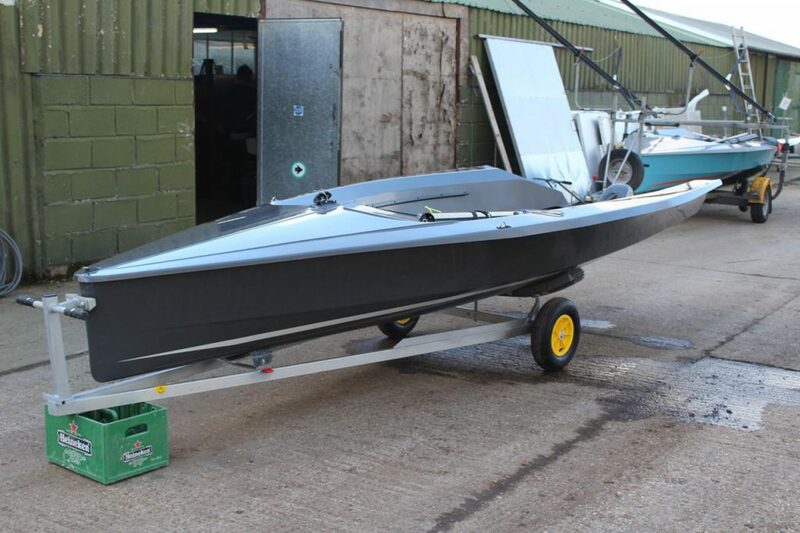 “If you want to get ‘close to the action’ with a continual barrage of spray then the Hadron H2 is certainly not the boat for you. Spray is deflected nicely and does not even come close to wetting your brow. After the first race in the boat, despite only 2 degrees of temperature and a brisk northerly wind I was forced to strip off a layer of clothing and my hat to prevent overheating. I’m too used to a ‘standard wet boat’ and was not expecting the comfort of the Hadron. The boat can be held almost head to wind without the fear of getting stuck in irons, a very useful feature when jockeying for pole position during a big fleet start. The ‘foot well’ in the cockpit ensures that it’s almost impossible to clip your head with boom when manoeuvring and yet the sail sits nicely close to the deck giving the boat a nice ‘racing look’. The boat looks like a bit like a Merlin and like the Merlin will outpoint almost any other single hander, it’s this advantage that must be utilised to gain a good result. The Hadron will hold its own on any run or reach but the big place changer is upwind. The boat takes kindly to any heel and does not stall disastrously as some other boats do even though sailing flat is of course beneficial. The Hadron planes quickly and will tack on a sixpence enabling wind shifts to be taken advantage of. I’m pleased that the boat is amazingly strong since a port tack yacht hit the boat very hard and yet only very minor damage resulted. Overall a very nice looking, comfortable, streamlined boat with plenty of cockpit room. My only criticism would be that the tell-tales were slightly too close to the mast and should be moved back by about 20cms. 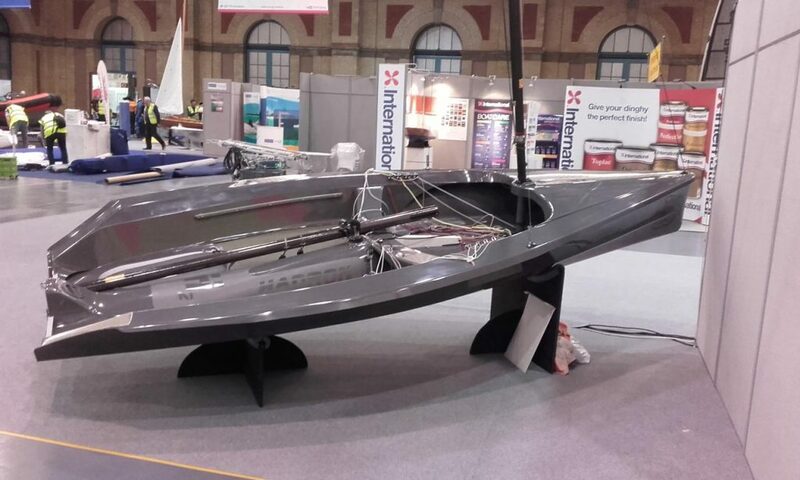 I’m not sure what your target market is and it might be an idea to play around with different sail sizes since the boat could certainly cope with a slightly bigger sail. Since sailing is an aging market this might not be suitable for your target market. A sensible sail size also has the advantage that the boat is capable of being sailed in almost any wind. I’m sure that in a strong breeze whilst others have to sit and watch the Hadron H2 sailors can be out enjoying their sailing. With regard my own performance, the boat is fine but I really was not up to scratch on the day having made too many errors which I repeated lap after lap. 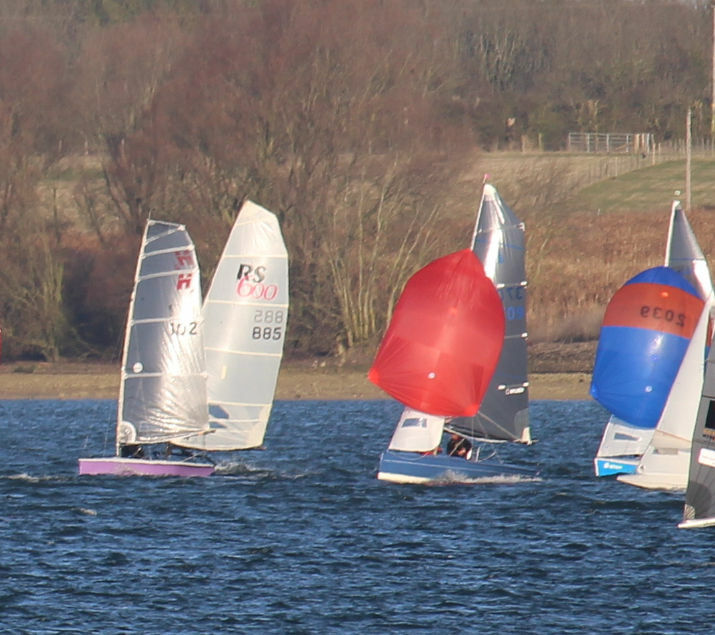 The main being that I did not take advantage of the H2’s advantage over other boats, it’s pointing ability!